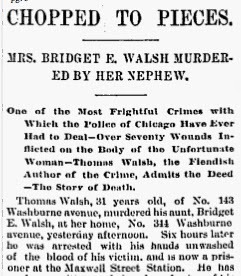 Here’s something you don’t hear about much: Victorian Chicago had a lot of murderers and murder victims named Thomas Walsh. Stranger still, more than one of these stories takes place right about on the sight of a modern Jewel Grocery store. In 1882 a Thomas Walsh flogged his wife to death (he was sentenced to thirty-five years, with the judge making remarks about a long, lingering death instead of a quick one on the gallows). In 1883, a Thomas Walsh got into a political argument that turned violent on Kinzie between Des Plaines and Halsted (where the Jewel is now) and got his head bashed in on a telegraph pole. In 1914 a Thomas Walsh was murdered and robbed of his Civil War pension money in Wheaton. In the 1920s, a labor leader named Thomas Walsh was arrested for murder. But the most gruesome of the Thomas Walsh murder stories is one from 1892. This one is so gruesome that I’ll immediately post something lighter after this, because I don’t want something this grim to be the first thing people see on my page, especially now that we’ve transitioned over from the old Chicago Unbelievable blog to Mysterious Chicago! I promise that in a few hours there’ll be a nice post with monkey and zoo animals in it. In May, 1892, Thomas Walsh was brought to Maxwell Street Station, where he wrote a confession claiming that he murdered his aunt, Bridget Walsh, at her home on Washburne Avenue (after renumbering and name changes, this would probably be right about in the footprint of where the Jewel grocery store at Ashland and Roosevelt is now). Murders happened all the time, but this one was most of the most gruesome in Chicago history. The house in which she was killed was tidy, for the most part, with a kettle still boiling on the stove when police arrived, led by her distraught husband. But as Sgt. Kennedy made his initial investigation, he slipped in what turned out to be half an inch of blood on the flood, then opened the blinds to see that there was blood everywhere – bloody handprints were all over the walls. The ceilings were splattered with stains. Mrs. Walsh’s body was found beneath a pile of clothes, alongside a knife and a pair of scissors. The condition of the body was given in graphic detail in the papers, but repeating it would be too gruesome even for me; suffice it to say that a broom handle being driven through the body is about the least of it. Enough witnesses had seen Tom Walsh in the area that he was very quickly arrested in his home, which was right near Holy Family cathedral. The nabbed him walking past Throop Street and dragged him to a nearby light. Tom was a known ruffian and knew both officers from several previous incidents. “I didn’t do it, Jack!” he said at once. “Do what, Tom?” asked the office. An inquest later found 115 wounds in the body. Thomas Walsh was found insane and sent to the asylum.